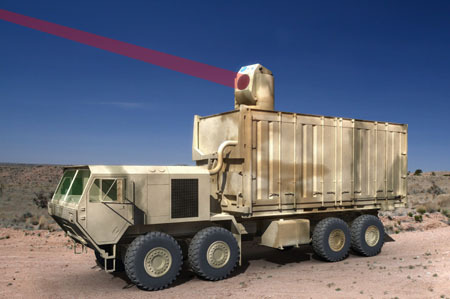 U.S. Army's High Energy Laser Technology Demonstrator (HEL TD), depicted here in an artist's rendering. ALBUQUERQUE, N.M., Oct. 26, 2009 -- The Boeing Company [NYSE: BA] today announced the successful completion of two key reviews for the U.S. Army's High Energy Laser Technology Demonstrator (HEL TD) program. Completion of a critical design review in July allows Boeing to begin building a rugged beam control system on a Heavy Expanded Mobility Tactical Truck (HEMTT), a widely used military tactical vehicle. A system functional review in June addressed key enablers for fielding a next-generation, solid-state laser weapon system. "This demonstration program is making significant progress in developing a weapon system that will transform the way soldiers are protected on the battlefield," said Gary Fitzmire, vice president and program director of Boeing Missile Defense Systems' Directed Energy Systems unit. "HEL TD's speed-of-light, ultra-precision capability will increase the warfighter's ability to counter rocket, artillery and mortar projectiles." The Army in 2008 awarded Boeing a contract to develop the system-engineering requirements for the overall HEL TD system and to complete the design of, then build, test and evaluate, a rugged beam control system on a HEMTT. HEL TD is a cornerstone of the Army's high-energy laser program. The HEL TD demonstration program will support the transition to a full-fledged Army acquisition program. Boeing leads the way in developing high-energy laser systems for a variety of warfighter applications. These systems include the Airborne Laser, Advanced Tactical Laser, Free Electron Laser, Laser Avenger and Tactical Relay Mirror System.